These hash browns were made using potatoes grown in the Hokkaido prefecture. The hash browns come in bite-size portions. This product used a potato variety called Hokkai-Kogane from the Hokkaido prefecture. 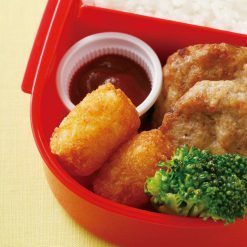 These bite-sized hash browns are easy to pack for lunch and into Tupperware containers or bento boxes. It is easy to heat using an oven toaster. 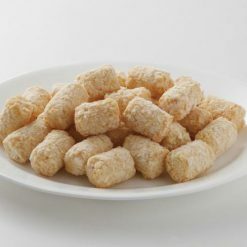 The hash browns also make great sides for your dinner or a small snack between meals. The Hokkai-Kogane potatoes were bred in the northern part of Japan in the Hokkaido prefecture. They’re mainly grown in Hokkaido Island. Kogane means “small pieces of gold.” The Hokkai-Kogane are a breed of potatoes with a particular oxidation pattern, and change color much later than other potato breeds, and are suited for frozen meals. They never lose their appetizing appearance. Originally a territory belonging to the Russians, the Hokkaido prefecture was one of the last frontiers for the Japanese. The Hokkaido Farming Experiment Station was founded in 1901, as was the state-funded Sapporo Agricultural College. Hokkaido has a rich history of agriculture, with some of its main industries and biggest exports being agricultural and fisheries products, as well as processed foods. Most of the dairy products and corn in Japan also come from this region. Defrost by using a toaster oven, frying on a frying pan or deep frying. When using an oven toaster, line the frozen hash browns on a sheet of aluminum foil. Make sure that the hash browns are not in contact with each other. Heat for 8 to 10 minutes, and check on your hash browns from time to time. When using a frying pan, pour a decent amount of oil into your frying pan. Apply heat and place the frozen hash browns on the pan. Turn the hash browns over from time to time. When deep frying, fry frozen hash browns at 350 degrees for 2 1/2- 3 minutes. This product contains potatoes (Hokkaido), salt, Joshinko (wheat flour), pepper, frying oil (palm oil). This product could be cross-contaminated with allergens. Origin of ingredients: potatoes (domestic; Hokkaido prefecture). Prepared and packaged in Japan.